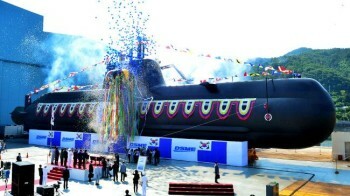 In light of the fact that the ROK (Republic of Korea), China and Japan are seeking to boost their naval capabilities in recent years, some now fear that East Asian countries may have entered into a “regional naval competition.” One explanation for the naval race, as recent territorial rows and controversies over Japan’s wartime atrocities demonstrate, is that the ongoing tension in East Asia remains rooted in historical grievances. Osaka mayor Toru Hashimoto’s remark in May that wartime brothels were “necessary…to maintain military discipline” coupled with the photo of Shinzo Abe inside the cockpit of a T-4 trainer with thenumber 731 stenciled on its fuselage seemed to evoke among the Chinese and Koreans memories of Japan’s imperial aggression during the Pacific War. Indeed, Japan’s seemingly strident militarist overtone may have worsenedthe extant historical enmity among the three major East Asian countries. To the historical grievances must be added another dimension—the fierce competition for energy resources. According to the National Geographic, “how much oil and natural gas is at stake, in either the South China or the East China Sea, is unclear [since] territorial disputes have prevented any reliable survey.” Nonetheless, each country’s efforts to “guarantee access to resources” will indubitably enhance its ability to “to shape international events according to a new definition of self-interest, one matching [the country’s] status.” As regards the territorial row over Dokdo/Takeshima, some aver that contradictory claims are based on “sequence of centuries-old records and half-told versions of more recent history.” To the extent that natural resources may be concerned, the Dokdo/Takeshima islets, although “poor in fresh water necessary to sustain human life,” are “abundant in fish.” Furthermore, the island is said to “contain natural gas reserves estimated at 600 million tons.” It can be argued, therefore, that in the Dokdo/Takeshima dispute, as with that of Senkaku/Diaoyu, energy security will retain “great salience” in the years, if not decades, to come. However, one major factor that may explain the exacerbating the East Asian arms race is the recent sequestration cuts within the Department of Defense which may make it more difficult for the United States to “manage its alliances and strategic partnerships in the region.” Keck argues that a new geostrategic environment whereby the United States increasingly desires to see its East Asian allies “shoulder more of the burden for regional security” may the create the perception that the United States presence in the region has diminished despite its commitment to the “pivot to Asia” strategy. 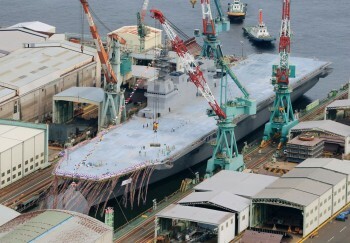 In short, the ongoing naval race, as represented through the launching of the Izumo, is an outcome of deep-seated historical enmity and rivalries over increasingly scarce energy resources. While some may dismiss the possibility of a regional war, slight miscalculation among East Asian state actors may indeed spiral out of control and lead to a lethal war. Notwithstanding the substantive defense budget cuts which could hamper flexible strategic responses, the United States nevertheless has a role to play to ensure peace in East Asia. “Leading from behind” to tame the ongoing East Asian naval race just may be the most cost effective way in which to exercise influence in the region. NOTE: In a follow-up article entitled “More Than Meets the Eye in Asian Naval Race” published at RealClearDefense, I argue that the naval competition among the three East Asian countries is driven by each country’s desire to look after its own self-interests and not necessarily by desire for imperial expansion. Just as Subic Bay is no longer in its once geo-strategic prime, the Navy of the Philippines has seen better days. As history records it, the Philippines has traditionally occupied the roles of both a logistical base and buffer for the West in modern 20th-Century conflicts. As one of the first U.S. outposts to be attacked and overrun in World War II, and later serving as one of the largest regional ports and airbases during the Cold War, the country finds itself on the cusp of the Asian Century serving once more as part of a virtual wall, this time holding back China’s slow but inexorable encroachment upon the second island chain. Article II of U.S. and the Philippines’ Mutual Defense Treaty (MDT) calls for both nations to sustain territorial control and maintain a basic self-defense capability. It’s hard to imagine now, but there was a time when the Philippines had one of the most advanced and well-equipped armed services in Southeast Asia. In the days following World War II, the geographical importance of the island nation and close ties to Washington brought a wealth of weapons aid to Manila while neighbors were rebuilding their war-torn infrastructure and fighting off internal security threats. Fast-forward to the present-day Philippines and the decades of underfunding and neglect are painfully apparent. The causes are numerous; most notably endemic corruption, a weak economy and focus on internal stability operations, but the end result is that the Armed Forces of the Philippines (AFP) is unable to put up a basic credible defense of the nation’s territory. Among other things, this undermines America’s China-containment strategy requiring allies to use political, and if needed, military options to mitigate a de-facto surrender of territory or economic resources. In 2003 under President Gloria Macapagal Arroyo’s administration, the AFP embarked upon what is now known as the Capability Upgrade Program (CUP). The plan’s core described eighteen blocks that span from Human Resources to doctrine and training all the way to force and infrastructure modernization. The funding would come from a variety of sources, including excise taxes and profits made from the joint venture Malampaya Oil Fields located off the coast of Palawan facing the Western Philippine Sea (WPS). A decade later, President Benigno Aquino the III’s term in office has most progressed this effort. While theoretically well-funded, the CUP is hamstrung by several factors: a convoluted, inefficient, and supplier-unfriendly logistics and acquisition process; the interference of serving politicos seeking to direct purchase decisions for their own benefits; systemic graft and corruption within public and military agencies; a struggling economy; and, competing needs to maintain and upgrade basic infrastructure and services required throughout the rest of the country. 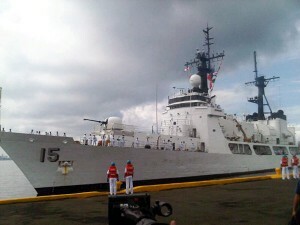 BRP Gregorio del Pilar, a Hamilton class US Coast Guard-Weather High Endurance Cutter. Foremost lacking for the PN are surface combatants with a baseline contemporary self-defense and offensive capability. 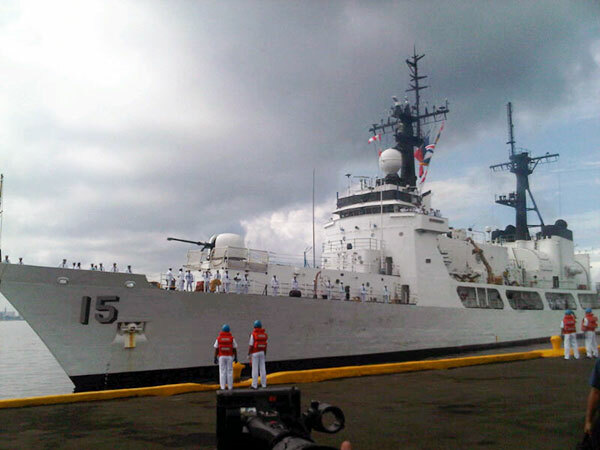 With the exception of the recent U.S. Coast Guard WHEC cutters and South Korean attack craft, most of the Philippine Navy’s fleet is well past the age (some are as old as 1943) where other nations would have decommissioned the vessels on safety and maintenance principles alone. None of the vessels are missile-armed nor anti-submarine equipped, and with the exception of recent acquisitions, most combat suites and sensors date back to the 1960s or earlier. For most of the fleet, major organic fires are limited to 5″ guns and smaller caliber cannons and machine guns. PF-16 Ramon Alcaraz (the newest of the WHECs) will receive the first upgraded shipborne weapons in several decades: two Mk 38 Mod 2 remotely controlled Bushmaster cannons. Immediate major combatant vessel acquisitions would likely be in the frigate class. Initially, there was consideration to purchase another nation’s Excess Defense Articles (EDA) – in the running were USN Perry class and Italian Maestraele frigates; but the recent experience with converting and refurbishing the former Coast Guard WHECs (particularly the delay with PF-16, the former USCG Dallas) educated PN and political leadership that buying new makes more fiscal sense then perpetuating the process of keeping older vessels going beyond their projected life-cycle. However, a recent boost in US military assistance aid could result in a third WHEC being obtained while bidding continues on the new frigate build. While quite a few manufacturers responded, the serious bids seemed to come down to a few – including Spain’s Avante 1800, Israel’s SAAR V, South Korea’s Incheon class FFG and unspecified options from Australia, Croatia and the United States . One of the benefits of having more recent used articles is that crews finally get training and experience on contemporary marine technology, such as Gas Turbine powerplants, and even the WHEC’s older combat integration system is still years ahead of what’s present in the rest of the fleet. What the PN also needs is more Off-shore Patrol Vessels (OPVs). The proposed re-integration of the Philippine Coast Guard back in the Department of National Defense (DND) highlights the service’s severe lack of assets to cover basic patrol and presence operations, never mind being able to deal with operations-other-than war (OOTW) such as the Sabah Crisis. A stop-gap purchase of a used French Patrol Vessel will help to restore PCG capability. Projected purchases include new build French 83m and 24m vessels and ten unspecified new patrol boats from Japan. As an unintended consequence, the PCG’s dearth of assets caused escalation in clashes with China. Confrontations over resources such as the Scarborough Fishing shoals forced the AFP to initially send assets that had the range and speed to reach the intrusion point in a timely fashion. This meant sending gray hulls like the newly arrived PF-15 WHEC while Beijing had only dispatched China Marine Surveillance hulls. The end result is that the Philippines inadvertently looked like they were escalating by using overwhelming force. Naval Aviation assets are sorely lacking. Due to attrition and the need to gain efficiencies with remaining inventory, serviceable military aircraft lie mostly in Philippine Air Force (PAF) inventories. The PN would especially benefit from long-range Maritime Patrol Aircraft (MPAs) to effectively cover areas such as fishing zones in the WPS and the contested Spratleys. Currently, a few BO-105 rotary craft and BN Islanders are providing surveillance roles. In 2012, a contract to deliver three AW-109 Augusta helicopters for utility and ship-borne aviation was concluded. These assets would presumably be paired with the new WHECs to deliver surveillance and potentially stand-off strike capability. There is a strong reliance on the PAF to provide the air defense and monitoring component – namely replacement military radar sites to complement the existing ATC network and tactical jets for basic offense and defense. There are enormous gaps in Strike and non-existent Air Defense/Interception assets. The Air Force is slogging through a long-convoluted deal with Korean Aerospace International for purchase of the T/A-50 Golden Eagle – a spinoff of the Lockheed Martin F-16 Falcon. The T/A-50 would play the role of a Lead-In Fighter Trainer/Surface Attack Aircraft (LIFT/SAA), paving the way to indoctrinate pilots in a future Multi-Role Fighter (MRF) yet to be selected. 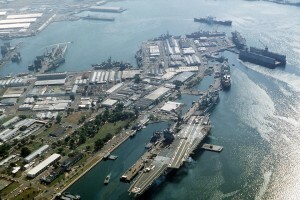 For logistical and lift needs, the PN has also been investigating MRVs (Multi-Role Vessels) such as the Indonesian Makassar Landing Platform Dock (LPD), a useful asset in both combat and Humanitarian Assistance / Disaster Response (HA/DR) operations – especially so for a nation often in the path of tropical typhoons. This is a gap that could be filled locally; an appropriate ferry with roll-on/roll-off ramps and a helipad could be converted or purpose-built. Additional basing and expanded facilities in the Spratleys and the Palawan peninsula are needed to complement any increase in force modernization. Ports, airfields, and refueling points within and facing the WPS would reduce reaction times and increase operational range of any assigned assets. With current basing, major combat assets face a 200 nm transit to get to contested areas. As an extreme example of infrastructure need, the Philippine Marine “garrison” in the contested islands is actually a grounded 1940s Tank Landing Ship (LST). A proposed expanded logistics and supply base in Ulugan Bay on Palawan would allow direct access to the WPS (instead of sailing around the island), as well as proximity security to the nearby Malampaya Oil Fields. And after years of commercial use, the Philippine government is contemplating more useful contingent access to the former naval base at Subic, which would allow visiting allies more than just courtesy access to one of the finest deepwater ports in the region. Despite all that, successful defense projects are possible to fulfill compelling strategic goals, even with limited resources. The Coast Watch South initiative shows that the AFP can deliver a competent maritime security environment with political and modest but sufficient fiscal support. The latter two are the critical factors to CUP success. It is the glacial pace of modernization that is ultimately the biggest threat to the CUP. As time passes, the opportunity cost to bring the major budget requisitions to fruition is rising ever higher. From a political perspective, there is the perpetual notion that EDA and stop-gap efforts are “good enough;” permissive factors in the past which in fact led to the current sad state of affairs for the AFP. The Philippine Congress and Aquino III’s administration are now suffering from sticker shock as they collectively realize what it will take to bring a “credible defense” to reality. That was most notable in the President’s most recent State of the Nation Address. The competing needs of domestic issues and persistent problems in the economy, healthcare, jobs and housing could end up diverting funding away from the CUP. With only two years left in Aquino’s term, the next Administration could have an agenda brings the progress made to a screeching halt. The cascade implications to the U.S. Pivot to the Pacific could put more burden upon the US Navy and Air Force to take up activities and responsibilities that rightfully belong to the treaty partner.